This is Helle Kühl. In May 2009 she was knocked off her bike by a car near Copenhagen's Central Station. The car was a rental driven by an American woman who was insured by American Express. 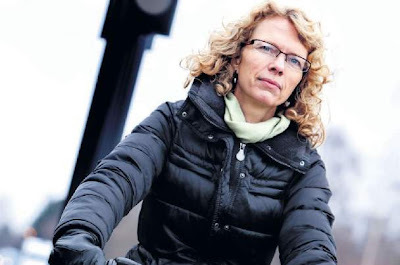 According to the Danish newspaper BT, the police have said that the American woman wasn't used to watching for cyclists and, after the accident, couldn't understand that it was her fault. Helle Kühl was heading straight on through an intersection. A right-turning bus had stopped for her but the American woman, who was turning left across the intersection, didn't. American Express, through a collection agency, has been hassling Helle Kühl for $3106.41 - about 16,000 Danish kroner - for the damages to the car. Helle Kühl said to BT newspaper: "This is completely insane. I'm an innocent victim and now they want me to pay 16,000 kroner because I got run over. This is an Americanization of the situation". There were many witnesses to the accident who back Helle Kühl op and who gave her their names at the scene in case she needed them to witness. Her Danish insurance company handled their side of it efficiently, paying out for a new bike, clothes and the traumatic experience. American Express has, however, sent five emails and two letters to Helle Kühl demanding 16,000 kroner for the damages to the car. She has tried to refer them to the car rental company and their insurance, to no avail. They continue to pressure her with their letters and emails, even though they have said earlier that the case was closed. Here's the letter from the collection agency, Vengroff & Williams Associates, which Danish Broadcasting has acquired. 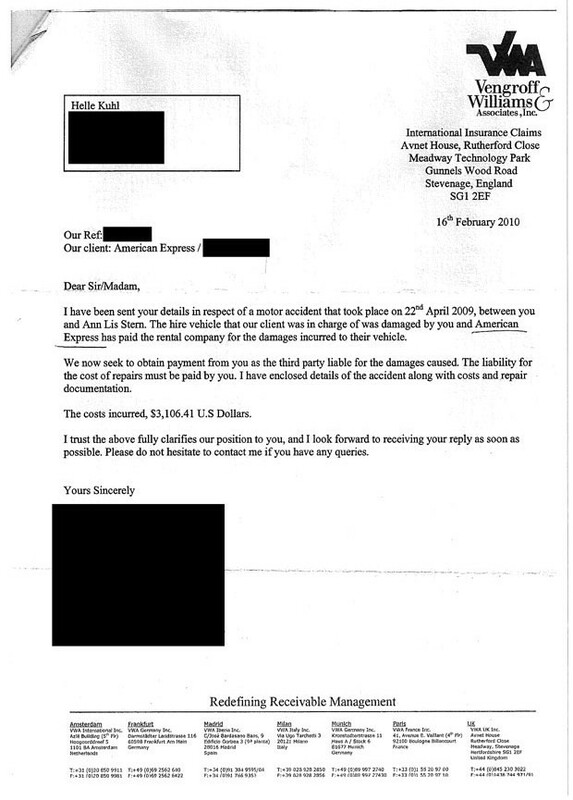 It reads: "The hire vehicle that our client was in charge was damaged by you and American Express has paid the rental company for the damages incurred to their vehicle. We now seek to obtain payment from you as the third party liable for the damages caused." Helle Kühl doesn't have to pay according to Danish law and a number of legal experts have stated clearly that she shouldn't worry about it. However, she may have to pay for a lawyer to tackle American Express and get the case closed. If she doesn't she is worried that she may have problems travelling to the US in the future. According to Danish Broadcasting, American Express have stated that they are looking into the case and are "taking it seriously". Via: The Danish newspaper BT's article "Innocent Traffic Accident Victim Sent Massive Bill" and Danish Broadcasting Corp. (DR).